Cut Price Kitchens have worked very hard to put in place an efficient and reliable service to most of the UK. Please note - we don't recommend that you book a fitter to fit any items until you have received them and checked them fully. Most orders are dispatched within 3-5 working days, are delivered between 7am and 5.30pm and must be accepted in person and signed for. In the event that the product is temporarily out of stock, or is likely to have an extended delivery period, we will phone or email you to advise of the expected delivery date. 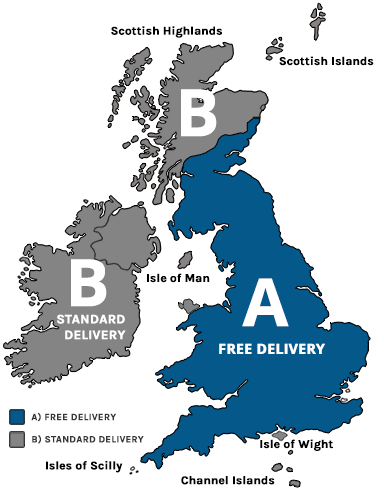 The offer of Free Delivery applies to your 1st Kitchen Furniture Order and any subcequent Oders may inccur a Delivery cost of £60.00 inc vat (please ask our sales team for any information). If you have ordered a small consignment of goods or a single item under 2 metres in length your order will be delivered by a trusted national parcel service. We will contact you by phone or send you an email detailing the day of delivery. Unfortunately we are unable to specify the time of day the delivery will be made, other than normal business hours. In the case of a missed delivery due to no one being at the delivery address to sign for the delivery will be a charge £60 for redelivery. We will contact you to take payment and arrange a second delivery. The drivers will only drop to a Ground floor location for insurance and safety reasons, if you live in a Flat / Apartment above ground or below ground, you must have means to get the worktops up or down the stairs. Please make sure there is at least one able bodied person available to assist the driver and we strongly advise you do not book a fitter before you have had your order delivered as manufacturing delays can rarely occur which are out of our control. Deliveries are made to Ground Floor Locations only. For larger orders, goods will be delivered by a tail-lift truck. Goods can only be delivered to ground floor addresses. Please make sure there is at least one able bodied person available to assist the driver especially if you have ordered tall units or worktops. If you live in a flat or other multiple dwelling please make suitable arrangements to get the goods into your property. If you are not at home on the pre-arranged day of delivery, a re-delivery charge of £120 including VAT will be applied for these types of order. Upon delivery, the customer must inspect the goods for any signs of damage before signing the delivery documentation. Delivery documents signed as unchecked or subject to checking, will be taken as an acceptance of the delivery in good condition. We suggest you pay particular attention to any fragile items. If you have any issues regarding delivery, please contact us by email or by phoning 0117 330 2277. Please note - we don't accept returns on Bespoke Orders e.g. Maia and Minerva. You may cancel your order at any time up to 14 days after you take delivery of the goods. If you would like to cancel your order once the goods have been delivered, you may return them for refund provided: 1. in the case of flat-pack furniture, they must not have been assembled, or 2. they are otherwise in re-sellable condition and are still in their original unopened packaging. There will be a Collection charge for us to collect from the original delivery address. There may also be a percentage restocking charge for returned goods subject to the original order Total which will be chargeable if we collect the items or you return them to us via your own courier. Should you wish us to pick them up there will be a relevent transport charge. Please phone us on 0117 330 2277 for prices and confirmation. When returning goods, it is recommended that the customer enquire about "damage cover" with their carrier. If the goods are damaged during return transit to us, a refund will NOT be issued in these circumstances. Once received, you will be refunded the cost of the goods less the original delivery and restocking charge. It is the customer's responsibility to check the order for damaged or missing items at time of delivery BEFORE the drivers paperwork is signed. Any claims for damaged or missing goods found when opening the product boxes must be made within 24 hours of delivery. Do not wait until the time of fit but inspect as soon as possible and we will do all we can to replace damged items prior to fitting (within reason) to save any additional installation costs.